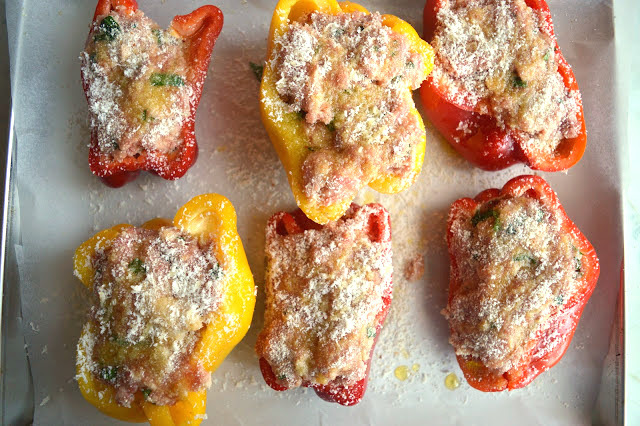 The idea to make these peperoni ripieni -- translated, stuffed bell peppers -- came to me via Instagram (source of many a good recipe-idea nowadays) when my friend Marco posted a similar recipe he'd made. Inspiration struck -- I'd stuffed tomatoes and zucchini before, but never peppers! 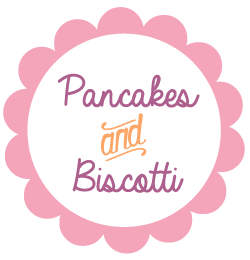 -- and thus this recipe came about, breaking up last month's spree of chocolate, caramel, pretzels, and bread (not that any of us minded, really) and offering something a little more wholesome, that nonetheless still falls into the warming, comfort food category. The facts: the filling here is reminiscent of a meatball -- a giant, splendid meatball -- starting with the usual suspects, meat and bread, that are then dressed up with lots of sharp Parmesan and sheep-y Pecorino, the slightest hint of garlic, and a sprinkling of bright parsley. 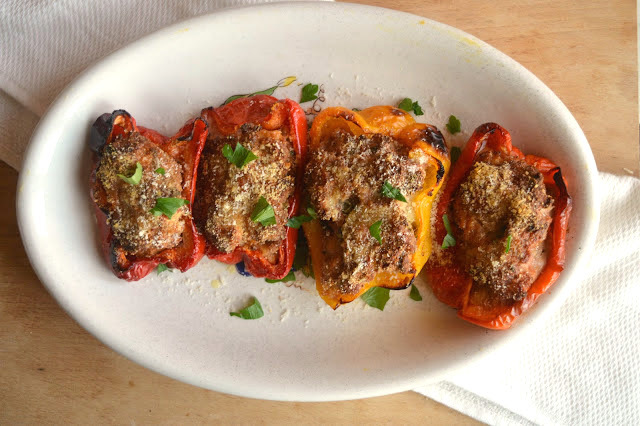 The real magic here, however, is in the details-- a few spoonfuls of breadcrumbs, a bit of Parmesan, and a drizzle of olive oil make the tops of the peppers crispy and crunchy and fantastic and the bell pepper itself! The bell pepper, like most veggies, transforms with a little time in the oven -- here they collapse, becoming juicy and sweet and a little charred around the edges, and prove they are so very much more than just vehicle for the filling. Bottom line: these are pure coziness, in the form of dinner. Extra points if you, unlike me, remember to pick up a few potatoes at the supermarket to roast alongside the peppers until they're nice and crisp and brown, as Marco recommended. Yummm. Notes: I used three bell peppers because that's all I had on hand, but this really should be made with 4 (I had leftover filling that I ended up using to stuff more bell peppers the next day). These would also be delicious if roasted and then served with potatoes, just like these tomatoes here. If you don't have Pecorino, you could also use all Parmesan here. This filling can be used for zucchine as well. Looking for more stuffed veggie recipes? I've only got a few! There are these these stuffed zucchine, these pomodori gratinati, and these other stuffed tomatoes with rice and served with roast potatoes. Cut the bell peppers in half lengthwise and remove any seeds or ribs. Set aside. In a small bowl, mix together the stale bread and the milk and set aside. 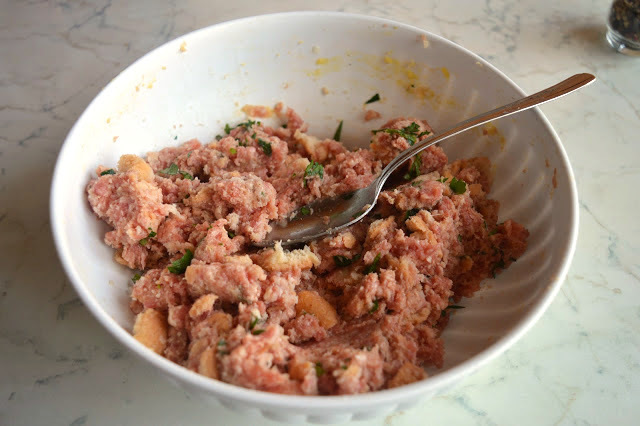 In a larger bowl, mix together the beef or veal, sausage, cheeses, garlic, and eggs. Squeeze the bread soaked in milk out to remove any excess milk and add it to the beef mixture. Stir everything together well and season with salt and pepper to taste. 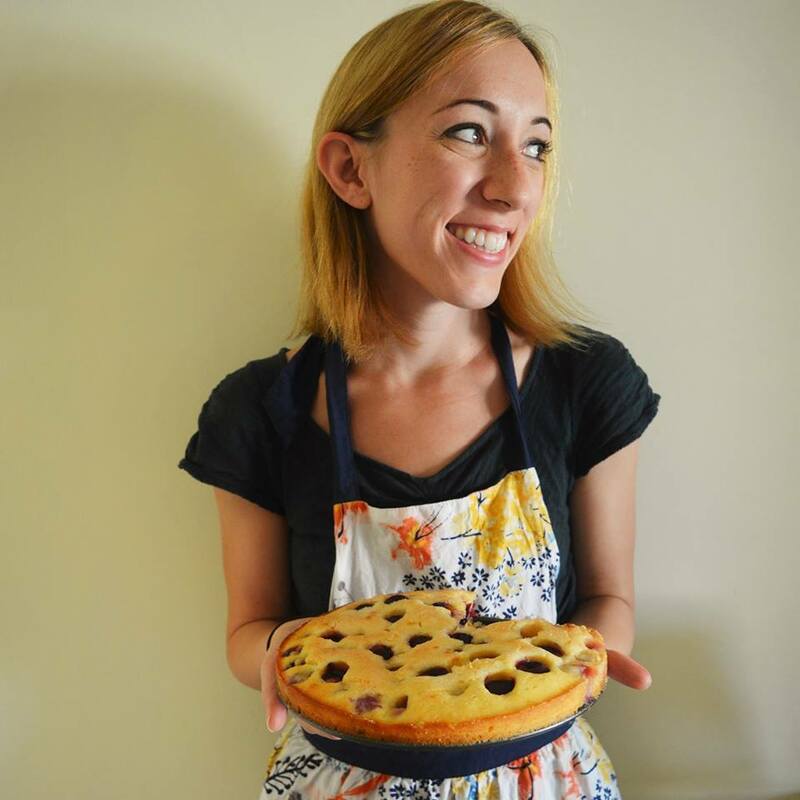 Remember that the Pecorino and Parmesan are already quite salty so remember this when adding the salt -- if you're squeamish about tasting the mixture you can always take a little bit of it and cook it in a pan and then taste it. Preheat the oven to 350 degrees. On and aluminum foil lined baking sheet, place your bell peppers. 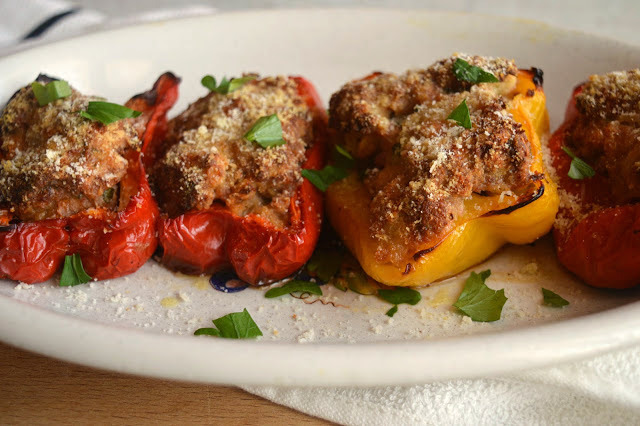 Stuff it with the beef mixture, and then top each stuffed pepper with a good sprinkle of breadcrumbs, a good sprinkle of Parmesan cheese, and a generous drizzle of olive oil. 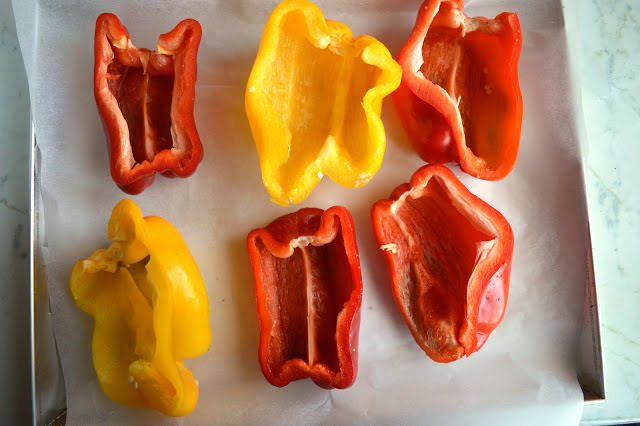 Bake the peppers in the oven for 50-60 minutes, or until the filling is browned and cooked through and the peppers are soft and slightly collapsed. Sprinkle with extra Parsley and a little extra Parmesan if you want and serve warm. Serves 4.